"By the dawn; by the 10 nights"
Praise be to Allah Who has created Time and has made some times better than others, some months and days and nights better than others, when rewards are multiplied many times, as a mercy towards His slaves. This encourages them to do more righteous deeds and makes them more eager to worship Him, so that the Muslim renews his efforts to gain a greater share of reward, prepare himself for death and supply himself in readiness for the Day of Judgment. Ibn 'Umar narrated that at Mina, the Messenger of Allah (peace be upon him) said, "Do you know what is the day today?" The people replied, "Allah and His Messenger know it better." He said, "It is the forbidden (sacred) day. And do you know what town is this?" They replied, " Allah and His Messenger know it better." He said, "This is the forbidden (sacred) town (Mecca). And do you know which month is this?" The people replied, "Allah and His Apostle know it better." He said, "This is the forbidden (sacred) month." The Messenger added, "No doubt, Allah made your blood, your properties, and your honour sacred to one another like the sanctity of this day of yours in this month of yours in this town of yours." In what follows, we will highlight some of the Sunnah regarding these days, hoping by this to provide an incentive to make the best out of them and gain Allah�s reward, insha�Allah. "�and to mention Allah�s name [plentifully] on Known days"
The day of �Arafah is the day when the pilgrims stand in worship on the Mountain of �Arafah. It is Sunnah to say Takbir ("Allahu Akbar"), Tahmid ("Al-hamdu Lillah"), Tahlil ("La ilaha ill-Allah") and Tasbih ("Subhan Allah") during the first ten days of Dhul-Hijjah, and to say it loudly in the mosque, the home, the street and every place where it is permitted to remember Allah and mention His name out loud, as an act of worship and as a proclamation of the greatness of Allah, may He be exalted. Men should recite these phrases out loud, and women should recite them quietly. "That they might witness things that are of benefit to them (i.e., reward of Hajj in the Hereafter, and also some worldly gain from trade, etc. 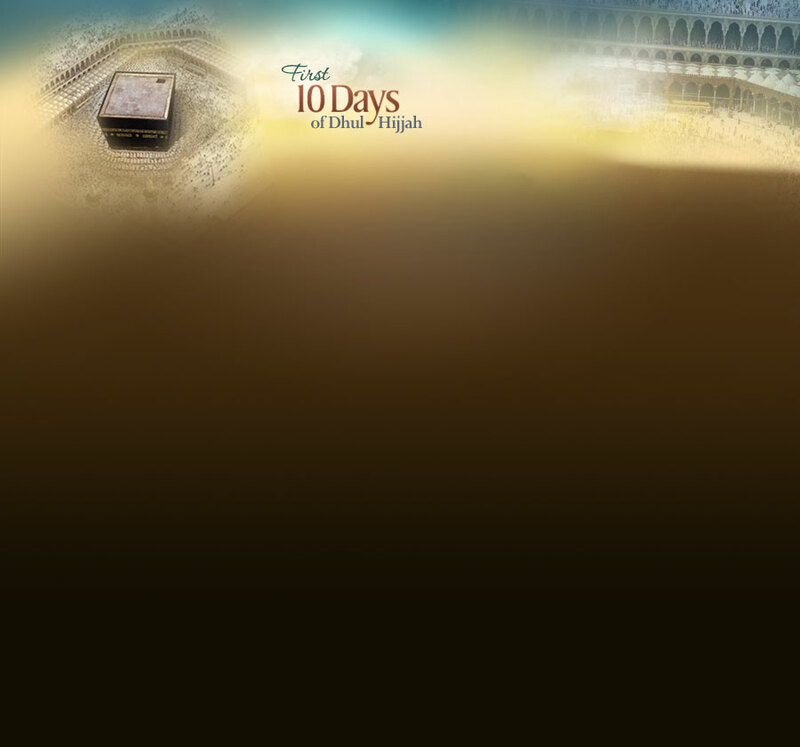 ), and mention the name of Allah on appointed days, over the beast of cattle that He has provided for them (for sacrifice)..."
The majority of scholars agree that the "appointed days" are the first ten days of Dhul-Hijjah, because of the words of Ibn Abbas (may Allah be pleased with him and his father), "The appointed days are the first ten days (of Dhul-Hijjah)." The Takbir may include the words "Allahu Akbar, Allahu Akbar, la ilaha ill-Allah; wa Allahu Akbar wa Lillahil- hamd (Allah is Most Great, Allah is Most Great, there is no deity worthy of worship but Allah; Allah is Most Great and to Allah be praise)," as well as other phrases. Takbir at this time is an aspect of the Sunnah that has been forgotten, especially during the early part of this period, so much so that one hardly ever hears Takbir, except from a few people. This Takbir should be pronounced loudly, in order to revive the Sunnah and as a reminder to the negligent. There is sound evidence that Ibn Umar and Abu Hurairah (may Allah be pleased with them) used to go out in the marketplace during the first ten days of Dhul-Hijjah, reciting Takbir, and the people would recite Takbir when they heard them. The idea behind reminding the people to recite Takbir is that each one should recite it individually, not in unison, as there is no basis in Shari'ah for doing this. The tenth of Dhul-Hijjah is Eid Al-Adha or the day of an-Nahr (slaughtering). It marks the conclusion of the major rites of Hajj, and commemorates Allah�s bounty on His Messenger Ibrahim, when He gave him a ram to sacrifice as ransom for his son Isma�il, peace be upon them. On these days, the pilgrims complete their rites, Muslims continue with their �Eid celebrations, and are prohibited to fast. "�Pray unto your Lord and slaughter [your sacrifice]"
The general consensus of the Muslim scholars is that the sacrifice is an important Sunnah, and a worship called for in the Law of Allah. However, they differ as to whether it is Nafl (voluntary) or Wajib (mandatory) for those who can afford it. Some scholars have explained the different hadiths on the subject by stating that the sacrifice is obligatory on those who can afford it and not obligatory on those who cannot. The one who plans to sacrifice (normally, the head of household) is prohibited to cut his hair or nails from the first Dhul Hijjah until he offers the sacrifice. "For the one who has a slaughtering to perform (on �Eid then, once the Hilal (crescent) of Dhul Hijjah is observed, let him not cut any of his hair or nails until he sacrifices." And in another narration: "Once the ten days start, for those of you who have the intention to sacrifice, let them not cut any of their hair or nails (until they sacrifice)." [Muslim] This prohibition is the opinion of the majority of the scholars of the early generations of Muslims.